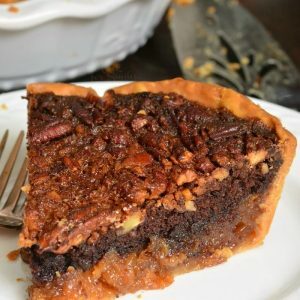 This pie is actually half brownie and half pecan pie. It is an amazing dessert that is actually easy to make. Preheat oven to 350 and grease a 9-inch, deep pie dish. Place pie crust in the pie dish, gently fitting it in. For the brownie layer, simply whisk all ingredients in a bowl until smooth. Spread brownie batter in the bottom of the crust evenly. Spread crushed pecans over the brownie layer but do not press. For pecan pie filling, whisk together the ingredients for pecan pie (except pecans of course), whisk vigorously for a few seconds. Spoon pecan pie filling over the pecans and brownie, try to spoon it evenly. Do not pour. Cover with aluminum foil, carefully tucking the ends so that you don’t squash the pie crust. Place the pie dish on a baking sheet and bake covered for 40 minutes. Take off foil and bake uncovered for 55-60 minutes. Take out the pie and let it cool and set for at least 3 hours (or overnight). You don't need to refrigerate this pie. TIP: To cut the pie easier, use serrated knife to gently cut through the pecan crust on top.